As an organisation, we’re constantly looking to deliver world-class art and inclusive experiences to both the local community and audiences from further afield. But, to do this we rely on the support of our visitors and supporters. We have number of volunteers who work closely with our core team at NCCD assisting in the delivery of numerous aspects of our exhibition and learning programme here at NCCD. Volunteers work in a number of capacities including working with the marketing, customer service, learning and exhibitions teams on a wide variety of project and events. Our volunteer scheme is a mutually beneficial experience in which volunteers assist in the delivery of our programme, while also developing skills and experience in a lively and creative environment. Volunteering at NCCD will allow you to become part of our friendly close knit team and gain a key insight into the workings of a nationally renowned arts venue. Volunteers also benefit from discounts in our café and shop, as well as invites to special events and exhibition previews. If you’re passionate about craft, design and the arts and have a strong customer focus then we’d love to hear from you. "My volunteering experience at The National Centre for Craft and Design has been of great use to me, my confidence and my future. The supportive staff play a key role in progressing my confidence, skills and knowledge in art specific areas. 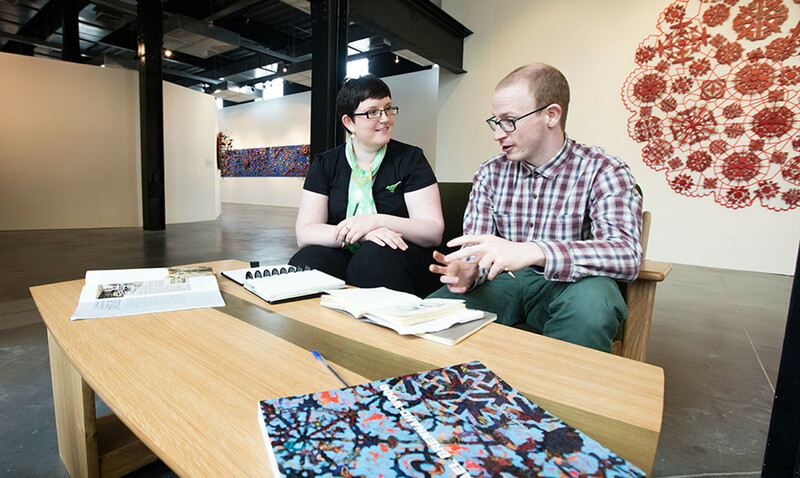 My aim for the near future is to secure myself employment in a workplace that echoes the atmosphere found within The National Centre for Craft and Design which radiates motivation, excitement and learning progression." We’re dedicated to providing a range of FREE events, workshops and world-class exhibitions here at NCCD, and in order to keep delivering such a high-quality programme donations from our visitors are more important than ever. Donations can be made in one of our donation boxes in our gallery or at reception.